Work accident claims are a grey area for employees, with many unwittingly continuing to function in a role with a work-sustained injury. It boils down to a commonly held belief that seeking compensation could result in repercussive measures made by the company, including demotion or dismissal. Recent revisions to UK law now deem it illegal for any employee to be dismissed as a result of filing a work accident compensation claim, so why wait? With extensive experience of work injury litigation and an empathic approach, our panel of personal injury law solicitors could unlock the compensation you deserve with one quick call! Work injury claims have been devised to provide post-trauma protection for any individual involved in a work-related incident that was not his/ her fault. You may have sustained an injury from a slip or fall in the office, contracted an industrial disease through prolonged exposure to hazardous substances, or suffered physically from an accident involving the use of machinery. Perhaps you are recovering from a traumatic car/ van accident which arose due to problems with a work vehicle. Our personal injury lawyers offer their award-winning services on a no win, no fee basis for all types of accidents. 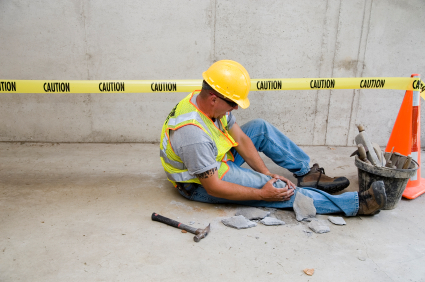 Have been injured in a slip, trip or fall in the workplace. Sustained injury following an accident in a company vehicle (such as a delivery van). Developed chronic symptoms of industrial disease. Were physically wounded by industrial/ workplace machinery. Suffer as a result of a FLT (forklift truck) incident. If you have endured an injury in the workplace, either from a fall, forklift truck (FLT) or noxious/ toxic substance, medical insurance cannot always compensate for loss of earnings, or contribute to long-term care costs. Employers have a legal responsibility to ensure the work environment conforms to safety standards and that such standards are maintained by personnel. Employers liability insurance is there to protect the company should a compensation claim arise, meaning the money does not come from your employer first-hand. Our team of personal injury specialists are adept in all methods of legal investigation that will not compromise your position within the company. We can even negotiate if you have been dismissed following work accident claims! Unlock the compensation you need to cover you whilst off sick. Aid with additional care costs. Ensure appropriate justice is served, where applicable. Help with on-going costs of care and rehabilitation (depending on your case circumstances). No win no fee work accident compensation claims can be notoriously difficult to understand if you don’t know your rights. Why not discuss your options with one of our trusted advisers? Call us on: 08 or simply fill out the short online form and a panel representative will contact you at a time that is convenient.